Turkish phyllos are thicker, a quality which makes it much easier to deal with them. The ones sold here at the markets are very starchy (great for desserts), really thin, and dry and break at every chance they have. If you're working on a börek [a general name for all savory phyllo pies in Turkish], that has a specific shape for instance rolls, rose böreks, the job becomes very challenging. Here's a recipe I've been working on, testing and tasting (what a torture!) for a while. Even if phyllos break it is fine, because the recipe requires to break them anyway. 10-12 sheets of phyllo sheets (usually one box has 20 sheets) I'd recommend to follow the instructions on the boxes for dealing with and thawing phyllos. -Grease a pan. I used a 9 inch round pan with relatively high sides, but you can use a rectangular or square pan provided the pan is smaller than the phyllo sheets. -Place two phyllos on the greased bottom. It's ok if they break while doing this; just make sure the bottom is covered. -Take 4-5 sheets, rip them into 3-4 pieces each and place them in the pan. -Whisk egg, milk, and oil with 1/2 teaspoon of salt in bowl. -With a spoon sprinkle 1/3 of the milky mix on the ripped phyllos. -Mix crumbled cheese and parsley and pepper flakes if you want some spice, and layer them on top of phyllos. -Cut the butter into small pieces, and layer them on top of white cheese. -Take another 4-5 sheets, rip them like the previous ones and layer on top of the cheese. -Pour another 1/3 of the milky mix on top. 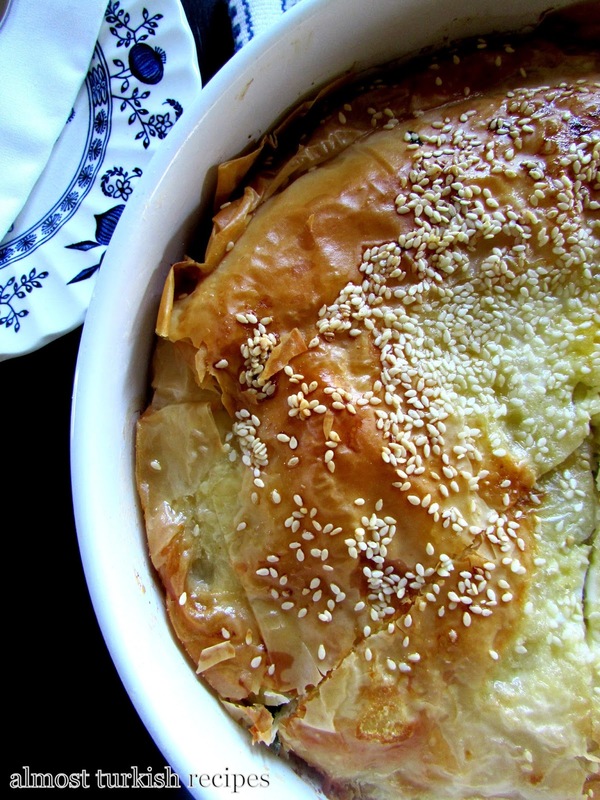 -Cover the pan with 2phyllo sheets, tuck the overhanging parts of the phyllo in with the help of a knife. -Pour the remaining milky mixture on top making sure it wets the corners as well. -Sprinkle the pie with sesame seeds. -Bake in preheated 390F for 30*40 minutes, or until golden brown. 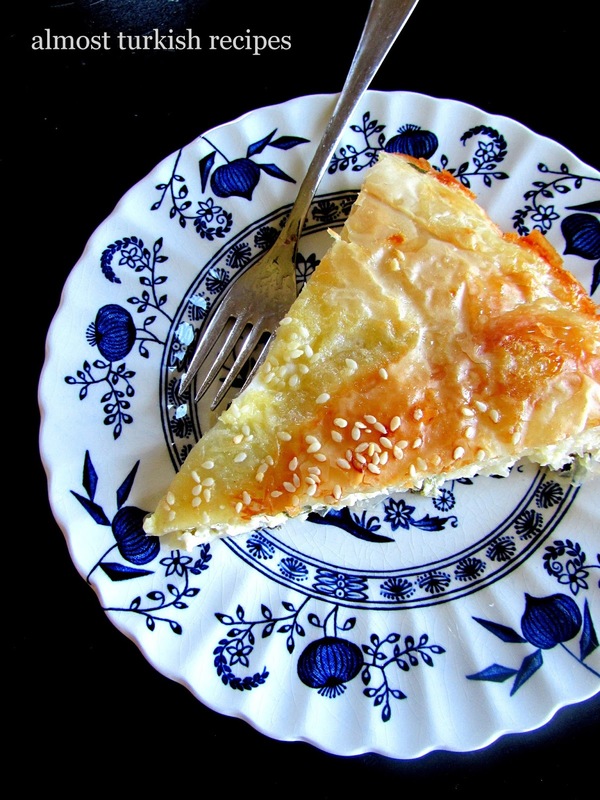 0 Response to "Easy Phyllo Pie (Kolay Peynirli Börek)"